For many, the cost of high-quality shoes may seem uncomfortably high. Premium shoes are worth the price, though—they boast a high level of wearing comfort and are significantly longer-lasting than their cheaply mass-produced counterparts. When considered in the long term, purchasing quality shoes is actually easier on the wallet. On average, we cover about 3 kilometres per day by foot. This adds up over the course of our lives—in total, we actually cover a distance equivalent to circumnavigating the globe two and a half times. As we go about our daily walking, our shoes are the only protection we have from hard asphalt, sharp stones and other people's (accidental) treads. Not all shoes are created equal, though, and shoes should definitely not be considered insignificant. A glut of cheap discount footwear has created the impression that shoes are unimportant, and has also relegated the centuries-old handicraft of shoemaking to the margins. In the meantime, high-quality Goodyear-welted shoes offer a multitude of benefits, and can notably improve the quality of life and capability of their wearer. They increase wearing comfort, reinforce foot health and, through their perfect fit and construction, ensure an elegant appearance, one which can be perfected with knowledge of the correct dress code. Even though quality men's shoes come at a significantly higher price, they pay for themselves through their longer durability aalone, since they save wearers the expense of constantly having to acquire low-quality footwear. Our comprehensive shoe encyclopaedia teaches readers how to identify the quality of premium men's shoes, as well as how premium shoes differ from cheaply mass-produced models. Our reader will find out how to select models with the perfect fit as well as how, through proper care, he can ensure a long lifespan for his shoes. Moreover, he will gain insights into the centuries-old art of shoemaking and leather production. To round out his knowledge, he should also take a look at classic types of men's shoes and how they are constructed and assembled. When it comes to high-priced men's shoes made by well-known brands, how can you be sure of their quality? A few tips help you differentiate between charlatans and classics. As the saying goes: "I am too poor to buy cheap things." Quality shoes come at a price, but last a long time and pay for themselves in the end. 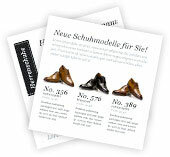 Quality shoes are professionally assembled from premium materials. Their construction, when combined with proper care, guarantees durability. Maintaining the proper temperature inside your shoe is not the only step you can take towards protecting foot health. Wearing anatomically correct shoes also prevents all kinds of afflictions. It should not be too hot or too cold inside your shoe. It can be difficult to create a comfortable feeling in your shoe—quality shoes make doing so easier than you may have thought. Aching feet (unnecessarily) detract from day-to-day job performance. Quality shoes with a perfect fit restore their wearer's capability. Shoes are more than just a means to an end. 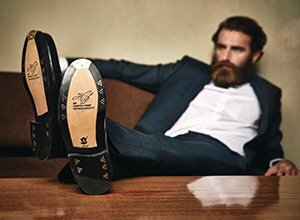 Thanks to the comfort they provide, Goodyear-welted full-leather shoes improve the quality of life of their wearer.